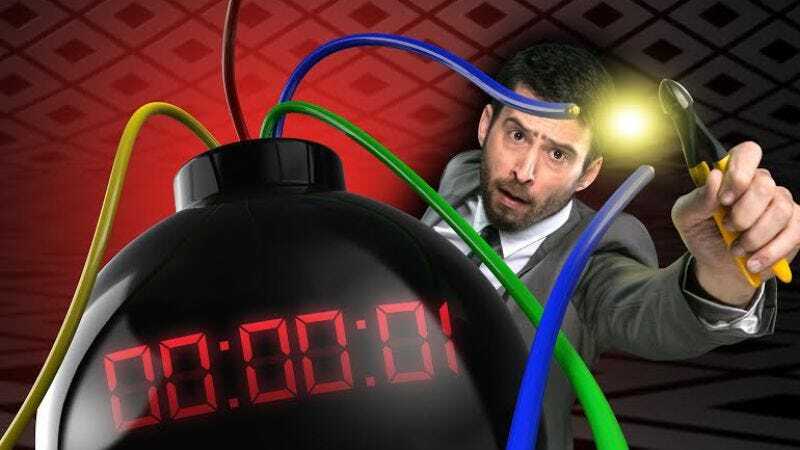 In a move that will definitely not piss off anyone, Fox has picked up Boom, a game show where participants answer questions to defuse a “bomb.” In order to “answer” these multiple-choice questions, the contestants must cut one of many colored wires within a time limit. There’s a series of eight bombs, and contestants play in groups of four. The more bombs they defuse, the more their bank builds. Boom recently had the most successful game show launch in Israel’s television history. “Never has a ticking clock been so ingeniously placed at the center of a game, and never has a game more inventively borrowed from the language of a thriller,” Simon Andreae of Fox said in a statement, followed by, “It’s as if Jack Bauer made brain love with Jeff Foxworthy.” What anyone from Fox has yet to say in a statement, however, is what happens when a contestant cuts the wrong wire. According to Deadline, in the Israeli version, “the bomb explodes, spewing material across the studio and shaking the set. The team loses one player per exploded bomb and 25 percent of the potential prize money.” Given all these details, reading the comments section below the announcement is encouraged.